As the centuries pass, waves of change wash over us - the invention of the steam engine, photography, space travel, the Internet. We may think these inventions change everything. But some things stay the same. Like our world-wide romantic fascination with a Princess finding her Prince, and their First Royal Kiss. And so it was only fitting that the highest traffic levels ever on Google App Engine occurred at the moment of the first (and second!) kiss between The Duke and Duchess of Cambridge. 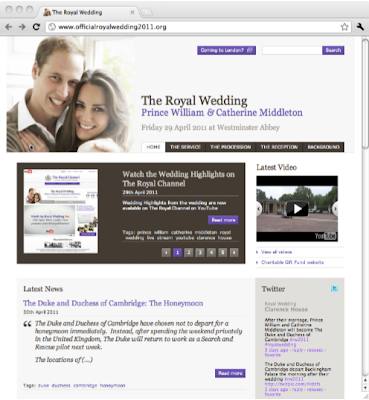 The Royal Household announced in March, that the Royal Wedding would have its own official web site, and it would be hosted on Google App Engine. The site was a great team effort between The Royal Household, Accenture, who built the site, the web design agency Reading Room who led on the design and creative work, and the Google App Engine team. The Official Royal Wedding web site generated over 2,000 requests per second, serving 15 million page views from 5.6 million visitors on the day of the wedding. Despite this load, the web site ran smoothly, serving off Google’s shared platform without disturbing the other 200,000+ apps, which collectively serve over 1.5 billion views per day. However, from a load perspective, the really busy Google App Engine app was the YouTube Royal Channel site. This app's traffic peaked at 32,000 requests per second (!) - with an additional 10,000 requests per second during the 10 seconds around the kiss(es). Whilst others were watching for a glimpse of The Dress, we were watching for a cloud platform non-event: the Google App Engine platform continued to operate normally. Both our wishes came true. If you’re planning an event of similar scale yourself, we’d love to hear about it. Our congratulations to the Royal Couple, and best wishes for the future! It would be great to see a more detailed report on how GAE coped with these loads. For example, how many Instances were started to deal with this number of requests?